So much for initial concerns that recreational cannabis would end up being a novelty. 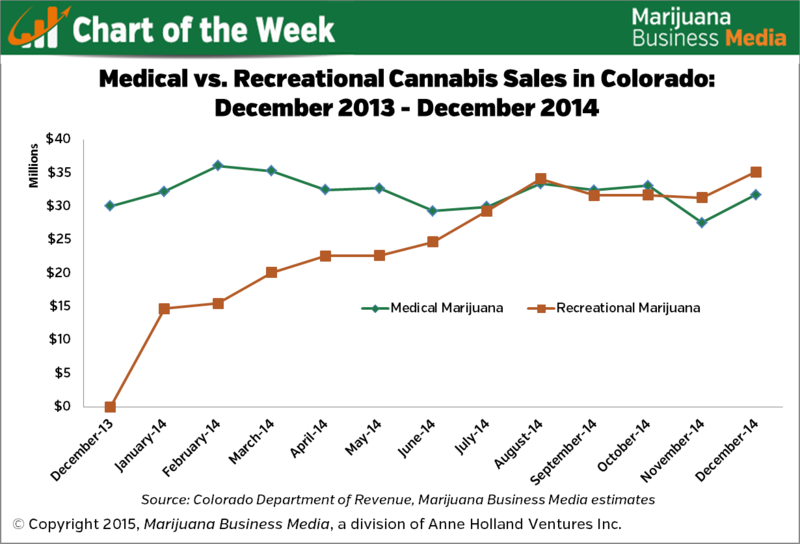 The rec industry had a meteoric rise in Colorado, with sales matching and then surpassing medical marijuana revenues in the second half of 2014. All told, the rec industry topped MMJ sales in three months of the year – including November and December – and will likely continue that trend for much of 2015, according to Marijuana Business Daily estimates. Some industry observers feared that recreational sales would start strong but then taper off in a few months as the newness wore off. Sales did indeed rocket after the first retail stores opened on Jan. 1, 2014, hitting $15 million during the month. But the upward trajectory continued, with monthly recreational revenues doubling by the end of the year to top $35 million in December. Although that sounds like an astonishing trajectory in one single year in one single state, recreational sales were actually artificially slowed early on. At the start of 2014, Colorado had only given licenses to several dozen recreational stores. By the close of the year, however, that number had risen to several hundred. Additionally, due to initial inventory chokeholds, many stores weren’t able to stock enough product to meet consumer demand until March or April. Thanks to more store openings and ample inventory, the long lines of customers waiting outside recreational stores have melted away, but demand hasn’t. There’s some debate in other areas, particularly Washington State, over whether MMJ should simply be folded into the rec market. But Colorado is showing that there’s strong demand for both medical and recreation cannabis products, proving that the two markets can – and possibly should – coexist. Will other states see similar patterns? It really depends on the regulatory structure. Colorado has supported its MMJ dispensaries and patients by creating a dramatically different tax structure, making it more affordable for those using cannabis for medical purposes. If other states that legalize rec follow a similar path, rec and MMJ can both thrive.